These two local beers require your attention. I love talking beer, whether it's here at City Weekly or in a random pub. I especially enjoy helping people find the beer styles that jibe best with their palate and personality. For some reason, I prefer to avoid talking about what beer is in my glass. When you're a beer nerd of the Nth degree, people tend to think your every beer is a $40 Beaujolais barrel-aged Dutch Melomel on cherries. Although those are fine every once in a while, I do also enjoy the occaisional PBR. So, though it's rare that I shout about what's in my glass, it's not unheard of. Today is one of those days. I had a couple of exceptional beers this week that I don't mind sharing with you, and these personal selections need to be on your radar. I'm not sure why Polygamy Porter has less cred in Utah than it does outside of our borders. Is it its availability or notoriety? All I know is that original Polygamy Porter is a top-notch beer, and its recent barrel-aged treatment is brilliant to boot. It looks like you'd expect—an opaque deep brown color with a pleasant foamy head featuring copper highlights. The nose is chocolatey and malty as hell, with aromas of rich brownies coated in a syrupy mocha glaze. Vanilla is also present, with some mellow medicinal booziness hanging on to the edges like perfume. Upon first sip, you get pleasant chocolate-covered vanilla ice cream with a dash of leafy hop and barrel char. Bourbon notes come in next—nothing really heavy, more like the memories you have of whiskey from the night before. It's pleasant and inviting, yet it adds richness. The end is rich and roasty and somewhat espresso-like, with a mellow wood dryness. Overall: Even though this beer has an ABV of 9.5 percent, its bourbon-barrel component doesn't seem to add to the heat. 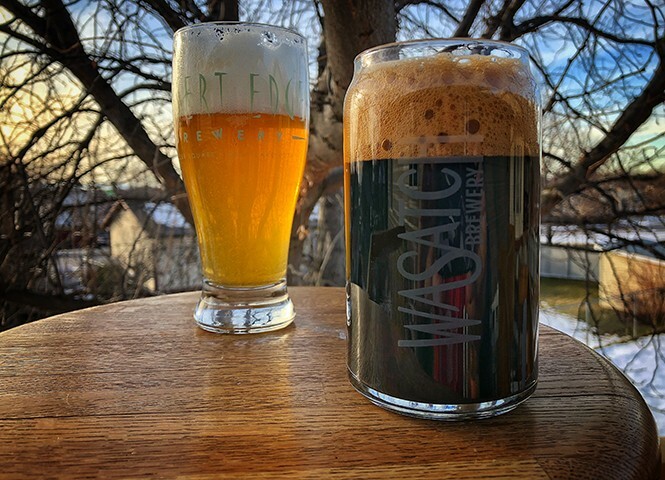 Wasatch has birthed an enjoyable variation on the Polygamy Porter theme that hits all the right marks. If you haven't had a beer for a few days, you know how important that first sip breaking your beer fast can be. If it's underwhelming, it can set the tone for the night. If it's brilliant, it's like watching Star Wars for the first time. My experience with Desert Edge's rye pale ale was definitely the latter. It's a flavor explosion that hits all the right notes, and you need to be aware of it. Its clear amber/orange color has light golden edges, with a single finger of white head leaving a subtle lace as I swill it down. The aroma has wonderful orange and lime scents right off the bat with some dry grassy rye on the back end, as well. The flavor starts with citrus with some sweet fruits—maybe pineapple—along with some flowery hops. This flavor profile is not really what I was expecting at the beginning; this almost tastes like a great IPA, without any bitterness later because of the hops. It ends with a nice dose of spicy rye malt. The finish is pleasantly dry. Overall: Although this beer might play to the IPA crowd, it's an all-American Pale Ale. The malt bill is more than the typical caramelized malt, and the hop selection plays very well off the spiciness of the rye. You probably didn't know about this beer yesterday, but now you do. What are you going to do about it? There you have it: A glimpse into my tiny mind. What do you think of these selections? I'd love your feedback.